Here are some very rough notes about shooting at the Tokyo Central Fish Market, also known as the Tsukiji Fish market. The photographs on this page are from my visit in September 2004. 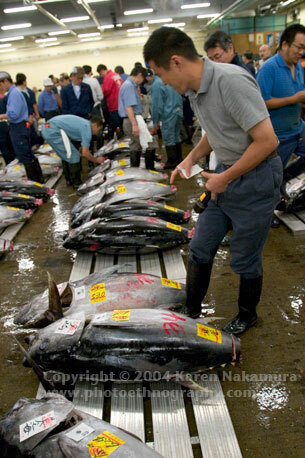 NOTE: Effective May 9, 2005, the tuna auction has been closed to tourists and photographers. This is because tourists were using flash photography, getting in the way of the merchants, and touching the fish. Unfortunately, all photographers will now need to get a permit in order to shoot. Don't even try to sneak in, they are VERY VERY pissed off at photographers and tourists. The outside stalls in the fish market remain open. For more information, see my blog entry. The nearest subway stop is Tsukiji-shijo on the Oedo Line. From there, it's a 100 meter walk to the main gate. There are plenty of maps in the subway to help you get there. Arrive as early as possible. The fresh tuna auction starts at 5:30 am and the frozen tuna at 6:00 am. These are the main auctions and are a must-see. The first subway arrives at the station at 5:21am. 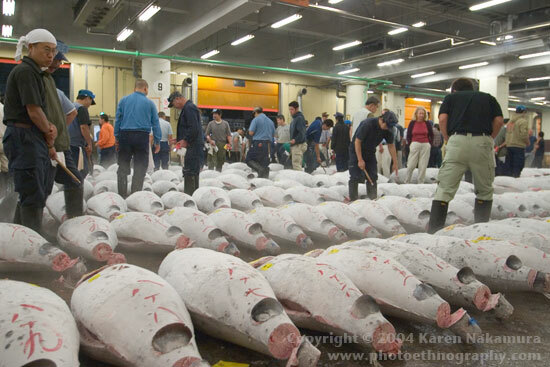 If you sprint, you'll catch the beginning of the fresh tuna auctions. The tuna auctions are held in the building furthest from the central gate. You'll recognize it by the bright orange doors. The auctions are all over by about 7am. You can still get great shots of the stands at the fish market in Tsukiji. These are where the huge fish that got sold at auction are chopped up and sold in smaller packages for smaller stores and consumers. Effective May 9, 2005: NO. Permitted isn't quite the right word. "Tolerated" perhaps. As long as you aren't in the way, and you aren't flashing bulbs directly into anyone's eyes, you will be tolerated. Don't push the tolerance too much. Be prepared to be brusquely pushed aside if you're in the way. Don't take offense. Apologize ("sumimasen") and move aside. Remember for you, it's all fun and games, but for the dealers it's life and death. In particular do not get in between the line of sight of the dealers and the auction callers. Boots, definitely. Maybe an older pair that you won't be too concerned if you get fish blood on them. All the dealers are wearing rubber waders. Long-sleeve shirt. 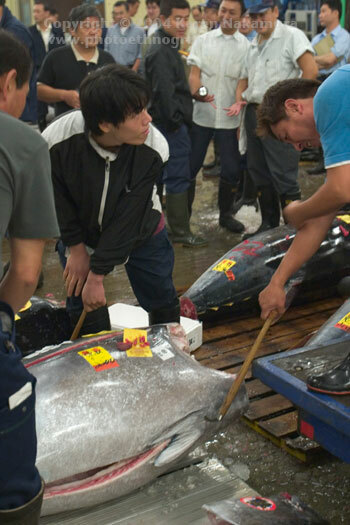 In the frozen tuna auction, the temperature is about 0°C (32°F). It gets a bit chilly. Put it on before you go in. Try to not wear a backpack or large camera bag. This will result in you inevitably hitting one of the dealers or knocking over merchandise. There is no good place to set your bag down without getting fish guts on it. Try to carry everything on your body or in a waist pack. This is the one place a camera vest will not make you look geeky. All the dealers wear them. You'll blend in. Febreze, the clothes odor neutralizer, is your friend. Buy some before you go to the fish market. When you come home, spray it on your boots, jacket, bag, and anything else that can't go in the wash. Put all your clothes directly in the wash and turn it on. Take a shower before taking a nap. Believe me, after being in Tsukiji all morning, you might not be able to smell the smell of fish anymore; but your partner can and may not be please at you for bringing it home. You'll want a very wide-angle lens (15-35mm) to catch in the breathtaking sight of hundreds of hundred-kilo tuna all lined up for auction. There are only a few places to set down a bag without getting fish guts on it. Keep your film and interchangeable lenses in your pockets or in a waist pack. If your lens has a maximum aperture of f/2.8, you'll want 800 speed film. With a lens of f/5.6, you'll want 3200 speed film. Everything is fluorescent lighting at the auctions. Set your digital camera to RAW and compensate later. For film cameras, use print film rather than slide film. The color temperature is about 2500-2800K and not very bright, so filtering slide film won't work well. If you don't have a good, bright zoom lens, then bring your primes instead. Using your flash too much may piss off some of the dealers. I used my Canon EOS 10D with 16-35mm L and 28-70mm L lens. This combination pretty much covered everything that I needed, except I wish I had a bit more on the wide end. I shot about 300 frames in one hour. There's a lot of action going on. Bring lots of film or memory cards. There are a whole lot of tiny 6-person restaurants attached to the fish market. They serve everything from sashimi to curry rice. Ask a local. Find someone with rubber boots on and ask them what is best. Peek into a store and gauge the rubber boot ratio. Note that #1 and #2 assume that locals know where the best food is. This is true, but it appears that dealing with fish all morning, the last thing they want to eat is fish. So if you go with #1, be sure to ask where the best fish is. Otherwise they may point you to the pizza stand. Note that the stores with the longest lines (#3) also have the lowest rubber boots:shoes ratio. This may be either because 1) locals don't have the time/patience to go to a store with a long line; 2) the really good places are too expensive for locals; 3) the locals think that these places are overrated and visitors are nuts; or 4) Japanese herd mentality is not always rational. Going to a store which has no line, no rubber boots, and menus in English is the sure-fire way to get a disappointing breakfast. 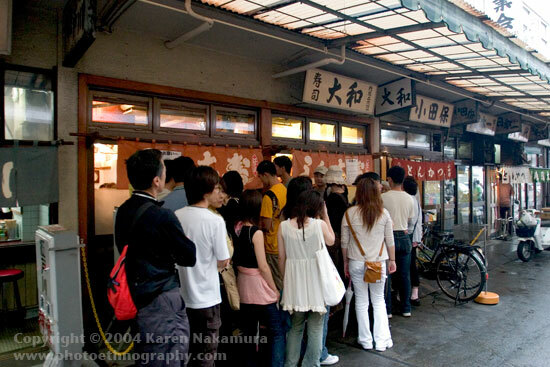 The same goes for ordering a meat dish at Tsukiji (what are you thinking?). If you want the Tsukiji fresh-fresh-fresh fish experience, Daiwa Sushi is the place to go. Expect a long-long-long line with no rubber boots and no english menus. sushibun. fourth generation. fantastic. no line. cheap. sushibun.